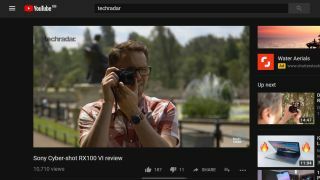 YouTube Dark Mode allows you to switch from the bright white light of the standard app or website to a deep black that's kinder on your eyes – particularly in a darkened room. Dark Mode is a relatively new addition to YouTube. It was introduced for desktop browsers in 2017, debuted on iOS (both iPhone and iPad) in March 2018, and landed for Android devices in July 2018. Dark Mode is easy to find if you're using the YouTube app on an iPhone or an iPad. Just tap on your account picture in the top-right corner of the app to open the Options menu, then select Settings > Theme > Dark. You can reverse this at any time by repeating the steps above and toggling the switch back to Light. Otherwise, the YouTube app will default to Dark Mode whenever you open it. This is a relatively recent feature and may take a while to rollout to your device, so don't be too disappointed if you can't use it for the next few days. To access Dark Mode, you'll have to open the YouTube app and head to the Settings section and press on General. Within this menu, you'll find the button to switch to the darker shade. Once you've switched this on you'll then find it's on by default, but it's an easy thing to change in the future if you just want to do the steps above again and switch it off. If you're using YouTube in a desktop web browser, click your account image in the top right to access the menu. About halfway down, you'll spot a switch to activate Dark Theme (ie Dark Mode). Dark Mode will remain active until you toggle it off by following the same steps. It really is that simple. Now you can enjoy your favorite YouTube videos in any lighting conditions without straining your eyes.